You didn’t expect me to break on the chair, did you? Photo courtesy of Mark Schreiber. Dammit!!! I miss read it. How am I supposed to shuffle my papers about on this pile of splintered wood? Add some vodka and you can break under the desk. The bottom right corner reads “0.1% fruit juice”. The other 99.9% must be concrete. “Pull Tab To Open” is for sissies. You can only break on the chair and desk but not the bed! I’d rather have a shattered coffee. To go, please. If I were not a gentleman, I would tell you ewhat I have done on an office desk. 1% juice is about normal here. I just make my own at home and take it with me. Perfect for winning that office break dance competition. Break on the desk or smash on the table, its all good. *sigh* We’re living in an age where desk polish is made with real lemons and herbs and herb lemon tea is made with artificial ingredients and chemicals. …however, you might want to move that receipt spike! Haha, and the katakana reads the same “Break on the desk” (“bu-re-i-ku o-n za de-su-ku”) so it’s totally deliberate. It’s probably 0.1% fruit juice cos it’s meant to be 0 calories (or ze-ro ka-ro-ri-i) lol! In case of fire, break glass. 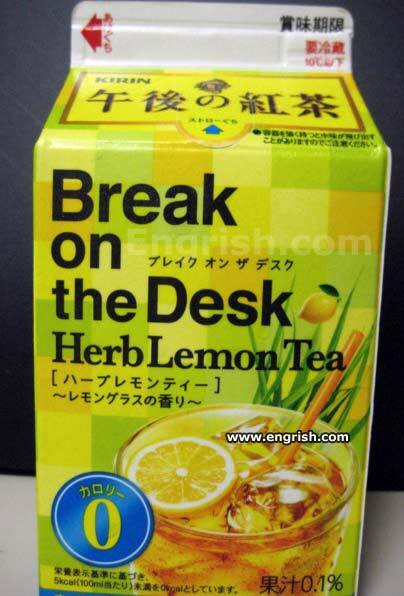 In case of thirst, break tea box. Just make sure you do that over there on your OWN desk! Kirin makes beer –is this like Mike’s hard Lemonade? I dd t, nd now hlf th vowls don’t work on my kybord. Lst tim I lt bvrg tll m wht to do. The same way you open an egg! Funny, in German “break” could also be translated as “vomit”. So it can read “vomit on the desk”. Haha.